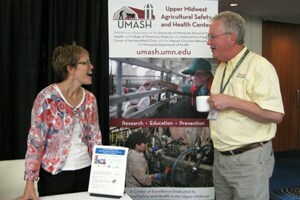 UMASH was a sponsoring partner of the North American Agricultural Safety Summit held September 26-28, 2013 in Minneapolis. In addition to hosting the poster session and contributing eight UMASH related project posters, Matt Kiefer, Center and Project Director participated in a Genius Bar – “Ag Related Ailments: The Doctor Is In”, Jeff Bender presented on “Worker Hazards From Veterinary Pharmaceuticals and Livestock Medical Treatment”, Amy Liebman participated on a panel discussing “Finding Common Ground: Working Together to Address Farm Worker Family Needs”, Iris Reyes conducted a learning station on“Farm Mapper – Using QR Codes” and Tammie Ellis conducted one on “Model Play Areas on Farms”. Scott Heiberger participated in a breakout session discussing “Child Labor Rules – Lessons Learned the Hard Way”. Outreach staff hosted a networking booth with UMASH resources available to all attendees.